Onam specials to kick start the festivities! Onam is a very special festival celebrated to commemorate the return of King Mahabali. These ten days are full of fun and festivities. So we bring you our special gifting selection to help you kick start the festivities. Special to Kerala and celebrated by Keralites the world over, Onam is the most popular festival for spending time with family and participating in traditional games and festivities. Flowers play a very important part in the festival of Onam from flower mats to offerings, they beautify and permeate the sweetest fragrance in different homes. 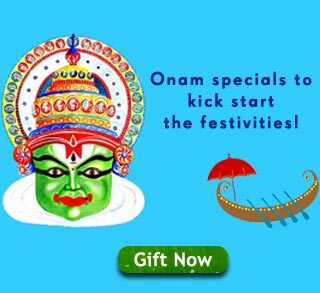 For Onam we bring you some of the traditional sweets and gifting articles which are sure to be much loved and appreciated by your family and friends across the globe. Given that Onam requires the adorning of brand new garments, we have also made a small clothing gift selection for you to peruse. From boat races to banana leaf meals, we hope you enjoy every moment that this season has to offer. Wishing you a very Happy Onam! ← Unique birthday gifts for your beloved lion or lioness !